Swing set chains are the quiet workhorse of the favorite playground activity of swinging. Children remember the sensation of swinging long after those little links of metal have stopped swaying back and forth. Kids talk about how high they went on a swing or who gave them a starting push while not thinking about how much trust they place in the swing with chain links suspending them above the ground. If you are responsible for purchasing, assembling, or maintaining a play area, however, you realize how vital a swing set chain is to children’s safety. At PlaygroundEquipment.com, we carry a range of durable swing set links and other accessories to repair or upgrade your play equipment, all at affordable prices. If you’re going to buy chains, hot-dipped galvanized chains for swings are a popular, durable, and economical choice. Manufacturers designed galvanized swing sets with swing set safety in mind to prevent pinched fingers, resist corrosion, and be very strong. 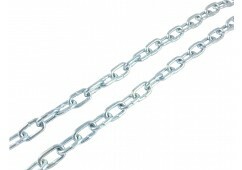 A galvanized swing set chain is light gray and simple in style but effective in performance. You can trust galvanized chains for swings to give children a safe and enjoyable experience on the swing set. If you are replacing the playground swing chains at a school or park where lots of children play, you can buy commercial-grade zinc chains by the foot or in bulk. The links in our zinc swing set chain come in two different sizes and can hold up to 3,900 pounds. These chains are also designed to prevent pinching. A plastisol-coated playground chain can give a whole new personality to the swing set. Plastisol is a coating applied to the metal links. When this gel coating solidifies, the swing chain has a plastic-like texture. This makes the metal easier for children to hold onto while they swing. Also, a plastisol-coated chain can be brightly colored. You can coat the full length of a playground chain with the colored plastisol, or you can buy links covered only in the grip area. With natural gripping, bright colors, and no finger pinching, a plastic-coated chain increases safety and style on the playground. You can use each coated playground chain with different seat types, including belt, bucket, glide, and tire seats. These playground swing chains can also be used with trapeze equipment. Soft-grip chains are another type of coated swing chain that gives young children a safe experience. This soft, colorful coating entirely covers the links in the area where children grip the chain. Swing chains with this option are available for sale in several colors. Like the plastisol-coated chains, soft-grip chains can be used with a variety of seat types and trapeze rings. You can use this swing chain to replace any other chain in swing set installation projects. Chain sleeves encase playground swing chains in a plastic covering. The lumpy link shapes are still visible and can be felt in the chain sleeves, but the plastic gives kids a better grip on the chain. Swing safely without worrying about pinched fingers or corrosion when you buy a chain with chain sleeves! No matter which option you choose, including if you want to buy chain by the foot, we’re sure to have the right chains to bring your whole playground together, and all our products are easy to install. Call today to get a quote or place your order and take advantage of our low prices and fast shipping!